Antonia Eiriz graduated from the San Alejandro School of Fine Arts in 1957. She participated in the II Inter-American Biennial in Mexico in 1960 and the 6th Sao Paulo Biennial in 1961, where her work received an honorary mention. From 1962 to 1969 she taught at the School of Art Instructors and the National School of Art, both in Havana. In 1963 she won First Prize at the Exhibition of Havana, organized by Casa de las Americas. The following year, Habana Gallery presented her important exhibition Pintura / Ensamblajes (Paintings / Assemblages). In 1966 she exhibited her work alongside Raúl Martínez at Casa del Lago in Mexico's Autonomous National University, and a year later at the 23rd Salon de Mai in Paris, France. 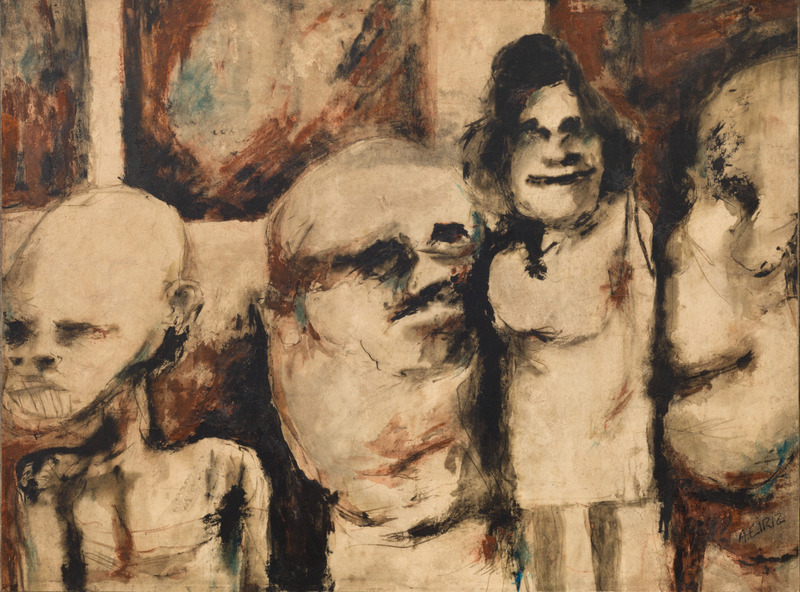 Eiriz had a very unique way of capturing her environment, choosing to depict the most dramatic and grotesque situations of the human condition, which caused her work to be misunderstood by the Revolutionary government, leading to her early retirement. By the end of the sixties she had abandoned painting and devoted herself to the promotion of forms of popular art, transforming her home into a workshop where she taught techniques such as papier maché and textile works to the local community. In 1989 she was awarded the Felix Varela Order by Cuba's Council of State, the country's highest distinction in the cultural field. In 1991 an exhibition of her work entitled Reencuentro (Reencounter) was held at the Galiano Gallery in Havana and in 1994 she received fellowship from the John Simon Guggenheim Foundation. After her death in 1995, the Museum of Art in Fort Lauderdale organized a retrospective of her work – Antonia Eiriz: Tribute to a Legend. Vigilia (Wakefulness), 1967. Ink and oil pastel on heavy paper laid down on board, 28 1/4 x 22 1/2 in. Apariciones (Apparitions), ca. 1995. Oil and pastel on paper, 28 3/4 x 23 in. Untitled, 1967. Ink on paper laid down on canvas, 29 x 23 in. Mis vecinas (My Neighbors), ca. 1960. Ink on paper laid down on canvas, 17 3/4 x 24 3/8 in.